Activists have questioned the process of terming individuals as ‘doubtful’, alleging that some people are simply framed. Social and psychological trauma and mental and emotional insecurity are reportedly on the rise in many parts of the rural as well as the urban Assam where updating of the National Register of Citizens (NRC) is going on a war footing in order to publish its second and final draft by July 30. Authorities refuse to state actual reasons behind the suicides, yet families and relatives of the deceased allege that it is linked to the fear of being declared ‘Doubtful Voter’ (D-voter) or stateless or foreigner or being sent to jail. Either way, personal, family and social life seem to be on the edge in India’s northeastern state. Balijan Bibi (45), wife of Azbahar Ali (52), a resident of Oudubi village under Jogighopa police station of Bongaigaon – who is presently lodged in Goalpara detention centre – committed suicide this month after she felt that she is unable to bear the burden of the family and legal battle expenses. Azbahar had been voting in Lok Sabha and Assembly elections since 1985 when his name first appeared in the electoral list. Because of a clerical error in his name (Azhar instead of Azbahar), he was listed as ‘D-voter’, and got a notice from the Foreigners’ Tribunal in 2012. Also Read: Assam’s NRC Officials ‘Fudging’ Data to Make People Indian or Foreigner? Azbahar had appeared before the Tribunal and had submitted all his documents – voter list since 1985, voter’s identity card and NRC of 1951, wherein the names of his grandparents are mentioned. While his case was being heard, he got two more notices asking him to prove his citizenship. Since the case was already under trial, he did not respond to the other notices. Ironically, he was reportedly declared a foreigner ex-parte and put behind bars on June 16, 2016. Following the detention of the sole bread winner of the family, his wife began working as a domestic help to manage the expenses. But unable bear the burden, she decided to end her life leaving behind her four minor children. The allegedly faulty and partial exercise of listing people as ‘D-voters’ is apparently creating rift in the families and is breaking relationships. When Avala Rai of Bidyardabri village of Dubri district was dubbed as a ‘D-voter’ and got a notice, she was left with no option but to face the trial. But her husband, a daily wage labourer, was not so economically well off that he could fight the case. This created a conflict in the family. They used to have fights. On July 7, he reportedly thrashed his wife in a fit of rage and committed suicide the next day. Gopal Das (65), who lived in Nisilamari village, was found dead on June 12 in a jungle near his house. Locals said he was distressed after he was declared ‘D-voter’. He allegedly chose death over his life, fearing the risk of losing identity or being declared stateless. “A notice was issued to him by the Foreigners’ Tribunal. A lawyer agreed to respond to the notice only after we paid him Rs 300. When the proceeding began, we were asked in the third hearing by our counsel and the magistrate to search for someone to stand bail as there was a chance of our being arrested. We were also asked to pay Rs 15,000, alternatively, to avoid getting detained,” alleged Ganesh Das, son of the deceased. Adding to his worries, Gopal’s daughter Shefali, who is 29 years old, also got a notice that asked her to prove her identity as an Indian citizen. “This further disturbed my father and he took the extreme step,” he said. A first information report (FIR) has been registered at Tangla police station where the complainant has accused the lawyer and the judge of taking bribes. The police confirmed that Gopal committed suicide, but declined to comment on the reason that drove him to take his own life. Gopal was barred from voting in 2016 despite purportedly having documents to establish genuine Indian citizenship, including his name in the 1966 voter list. On March 23, Lalson Ali, who belonged to Shatagaon village in Barpeta district, hanged himself at home after being classified as a ‘D-voter’. “Despite having Legacy Data (a bunch of papers required to prove ancestral legacy, voter identity card and a PAN (Permanent Account Number), he was extremely scared. It seems that he had been intimidated by someone that he would lose his nationality,” said his son Mukkedesh Ali. Khairul Islam’s wife Sahimoon Bibi, whose father had migrated from Bihar to Assam to earn a living, allegedly hanged herself on April 11 because she failed to get legacy data, which is necessary to prove citizenship. Now, her five siblings and their families are also under immense pressure to prove that they are Indian citizens. The list does not end here; there are numerous such incidences of suicides in the past few months. Ratan Rai, a government employee with the Inland Water Transport department, ended his life by reportedly hanging himself at Colony No. 4 in Pandu – a locality in Guwahati, after he failed to produce all the papers required. He feared that his name might not be included in the final draft. Anowar Hussain (37) – a daily wage earner – got a notice on December 1 from his NRC Sewa Kendra, asking him to furnish a proper birth certificate for his 9-year-old daughter, Jahanara Khatun. He felt helpless, as he had no idea how to get a birth certificate. He went to the primary school where her daughter had attended classes four years back. But the school too asked him to furnish other details so that it could issue a certificate. He gave up and committed suicide by allegedly consuming pesticide. He had documents showing his and his wife’s father’s name in the 1966 electoral rolls. But he thought his daughter would be deported to Bangladesh, said locals. Hanif Khan (40) was found hanging from a tree near his residence at Kashipur (Part-II) in Cachar district on January 1.He was a driver by profession, and was staying at a rented house with his wife and three children. He originally hailed from Pailapool. According to the local residents, Hanif committed suicide after not finding his name in the first draft of the NRC. His wife Raksa Khan said her husband had been worried over the NRC issue and always wondered what would happen if their names were not included in the NRC. Raksa, who works at a photostat shop in the village, said her husband recently feared going outside and immediately returned home if he saw any police vehicle in the vicinity. Hanif went missing on January 1 at around 7 pm, and his body was found at around 6:50 AM the next day. Cachar SP Rakesh Roushan confirmed that it was a case of suicide. Often, people who cannot read or write believe rumors that they might be sent to Bangladesh if their names are not found in the citizens’ registry. A psychosis has set in among the poor and uneducated, as many have lost or not kept important identity documents. There are common complaints that the Election Commission officials and the Border Police – the verification authorities – are partial, and are not discharging their duties properly. Their officials reportedly randomly pick the names of Bangla-speaking Hindus and Muslims during the investigation process and classify them as ‘D-voters’. The identification process has haunted citizens in Assam for years. In 1997, the Election Commission of India began to scrutinise the list of voters to try to segregate citizens from non-citizens in the state. The letter ‘D’ was marked against those whose documents were inadequate to pass verification by officers specially appointed for the purpose. The ‘D’ is removed from the voters’ list if the Foreigners’ Tribunal declares that these individuals are Indian citizens after a trial. The Election Commission sends ‘D’ cases to the Superintendent of Border Police in respective districts, who refer them to the Foreigners’ Tribunal. The NRC is a mammoth exercise which is underway in Assam to make a list of the state’s citizens. The list was last made in 1951 and an agreement to update it was reached, back in 2005. The former Congress government in the state finally began the exercise in 2015. But it is only now, under the BJP-led government, which won with illegal immigration as a major election plank, that the NRC has got an aggressive push. The Supreme Court is monitoring the process of updating the register to identify illegal migrants in Assam. Officials working on the register have to ascertain the citizenship of people who live in Assam based on each person’s ability to prove residency in the state on or before March 21, 1971. People excluded from the register risk being classified as illegal immigrants in the state, which has seen migration from Bangladesh since the early 20th century. Activists have questioned the process of identifying some individuals as ‘doubtful’, alleging that some people are simply framed. According to the white paper on foreigners, only 12,913 people out of 45,456 cases between 2006 and July 2012 were found to be foreigners. That means some 75 per cent were assessed to be genuine Indians. In the period up to 2016, some 6,21,688 people were branded as ‘doubtful voters’. And in February 2017, Assam’s Parliamentary Affairs Minister Chandra Mohan Patowary said that 4,44,189 people were referred to the Tribunal to assess their status. Panic has further spread after National Register of Citizens coordinator Prateek Hajela revealed that 50,000 people listed as ‘doubtful’ and declared foreigners would be left off the final draft. On May 2 this year, the NRC office instructed the Superintendent of Border Police to eliminate siblings of those who are declared ‘D-voters’ or foreigners from the final list. That means around 32 lakh people could face citizenship strife, said lawyers and activists. 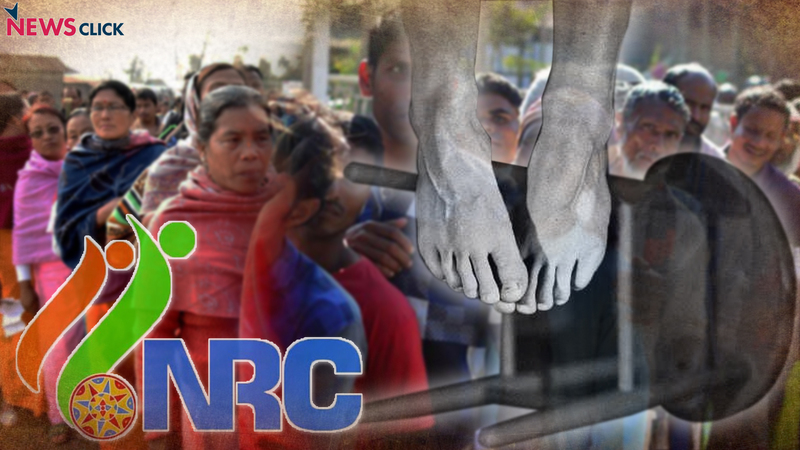 A little over 3.27 crore people belonging to about 68.21 lakh families have submitted applications so far for inclusion in the NRC. With the second and final list due in a couple of weeks, it appears that the government has done little to calm fears that people could lose their rights and status if they are declared non-citizens.